Mr Jaime Newman Invaluable, voluntary, ongoing IT technical support and troubleshooting of a complex kind, along with helpful personal coaching and encouragement, which have made this website possible. 2003 M. Claude Aubrun The author of http://arrausite.free.fr/Index.html which was a source of inspiration for the current ArrauHouse website. Mr Aubrun has kindly provided extremely valuable information, advice and material, as well as encouragement, ever since first contact. A Professor of Physics with the Michigan State University, Mr Berz has contributed invaluable photographs, information and suggestions, as well as alerted the editor as to typographic errors and inconsistencies. Particularly useful has been his assistance with the German language. He has pledged long term support with the website contents. Mr Kasper Janse Mr Janse was a Cofounder and Curator of the Pianola Museum of Amsterdam, established in 1981. He has contributed invaluable information about German Virtuola piano rolls perforated by Arrau at the age of 8, which are preserved at this Museum. Mr Raúl de la Mora Mr De la Mora, a pianist and seasonal student of Maestro Arrau, has kindly contributed numerous scanned images of photographs and documents, as well as information relevant to the contents of this website. Mr Jaime Reyes C. Mr Reyes, a medical radiology technician, has kindly contributed a number of scanned images of concert programmes performed by Maestro Arrau in Chile and elsewhere, as well as photographs and other valuable information relevant to the contents of this website. 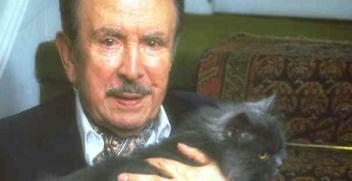 de España Programmes and reviews on Claudio Arrau's early performances in Spain. Mr Misha Horenstein Mr M. Horenstein has kindly contributed information relevant to the contents of ArrauHouse, including scanned documents, as well as advice on the long-term musical rapport and personal friendship between conductor Jascha Horenstein and Claudio Arrau. Mr William Davison Mr Bill Davison, a pianist and database specialist, kindly contributed useful information related to the contents of ArrauHouse and, in particular, important details on the series of interviews with Maestro Arrau which were broadcast by radio station WNCN of New York in February 1981. Mr Francisco Contreras Mr Francisco Ricardo Contreras del Despósito, an audiovisual communicator and admirer of Maestro Arrau, kindly contributed useful information concerning the contents of ArrauHouse, especially details of recital programmes related to Arrau's early career, as well as photographs personally taken in Chillán. Mr Claude V.C. Melody Pianist Claude-Victor-Xavier Melody has kindly contributed a number of newspaper clips regarding Maestro Arrau's Australian concert tours over the years. This material has informed a good number of the Australian entries found in ArrauHouse's Chronology pages. Staatlichen Instituts für Musikforschung Preuβischer Kulturbesitz Annoucements and programmes concerning Claudio Arrau's early performances in Berlin. Prof. Eric Derom Prof. Dr. Eric Derom MD PhD, from Ghent University Hospital, an admirer of Maestro Claudio Arrau, has kindly provided links to valuable databases in German, containing information relevant to 'ArrauHouse'. Sr. Gabriel Peña Mr. Gabriel Eduardo Peña Jara has supported 'ArrauHouse' by kindly providing valuable information, photographs and documents. 2011 - two complimentary copies of 'Arrau with Szell live from Carnegie Hall', double CD WHRA 6037. 2012 - one complimentary copy of 'Claudio Arrau in Recital 1969-1977', triple CD Music & Arts CD-1263; and one of 'Claudio Arrau at Tanglewood', single CD WHRA-6047. 2013 - one complimentary copy of 'Claudio Arrau at Tanglewodd - All-Mozart Recital', double CD, Music & Arts CD 1274. Mr. Maroth passed away in 2014. From St-Laurent Studio, one complimentary copy of CDs 'Claudio Arrau Vol.1' and 'Claudio Arrau Vol.2' with audiophile, no-filter tranfers of 78 rpm recordings. Two complimentary copies of the DECCA CD PROC-1294, distributed by Tower Records in Japan, containing three works by Bethoven, Liszt and Chopin, performed by Maestro Arrau live in Munich in 1983. One complimentary copy of DECCA CD UCCD-7339 from Japan, containing two Beethoven sonatas for piano and violin with Arrau/Grumiax and Haskil/Grumiaux.